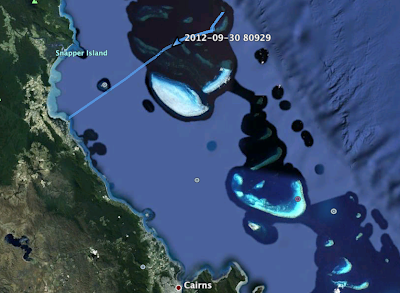 We left Cairns on Friday at about 14.00 hrs. The road runs mainly directly along the coast, which provided us many times with splendid views of the Pacific Ocean. But the road appeared to be rather busy, with cars sometimes passing very closely, there mostly was no cycle lane, sometimes hardly any shoulder. Night falls quite suddenly here and at 18.00 you definitely need lights. Alas we don't have them on our sophisticated riding machines. So in the end we had to race in order to reach our destination in time. It was after 65 kms that we pitched our tent in the dusk at Pandanus Caravan Park. Good facilities, comparable to Europe, but strikingly many caravans towed by 4-wheel drives. It was to be our first night in a tent after last year's unfortunate events. As we couldn't get on a boat for a visit to the Great Barrier Reef on Saturday, we hung out in the pretty and very well kept touristic centre of the village. Shops, bars, restaurants, terraces. Full with people watching the Grand final of “Australian rules”, a kind of rugby I would say. Someone told us that the significance can be compared with the Champions League final in Europe. On Sunday we snorkled on the reef. The cliché is true: it is magnificent. We sailed out to the outer reef, that is about 60 kms out in the ocean. We visited three locations and really saw species of coral and fish that we could not have imagined if we tried. It is an expensive excursion, but once here you cannot let this pass unseen. And the services provided by the staff on board are boundless. They provide everything, gear, food, a helping hand and explanation of the eco-system. Well guys, great job! Tomorrow we'll head for Cape Tribulation, the most northern point of this trip. If all goes as expected we'll pitch our tent in the middle of the tropical rainforest just a few meters from the white beach. Frans en Eveline, wat fijn dat jullie weer onderweg zijn! Ik blijf het ontzettend leuk vinden om jullie verhalen te lezen en jullie op deze manier te volgen. En Australie is 1 van de landen waar ik ooit nog naar toe hoop te gaan, dus ik lees deze verslagen met extra interesse! Goede reis! Groetjes, Susanne (en nog bedankt voor jullie kaartje!